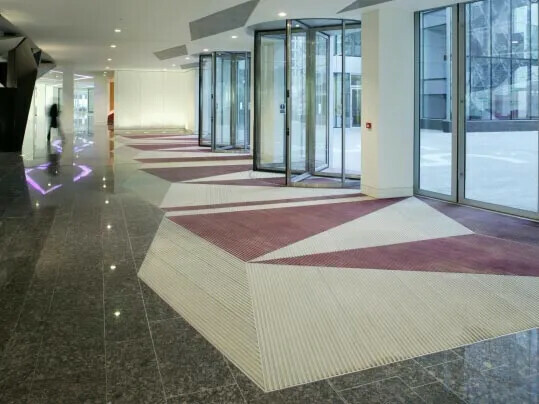 Nuway Tuftiguard entrance flooring has the durability, strength and structural integrity to deliver excellent performance and appearance retention in very heavy traffic locations. 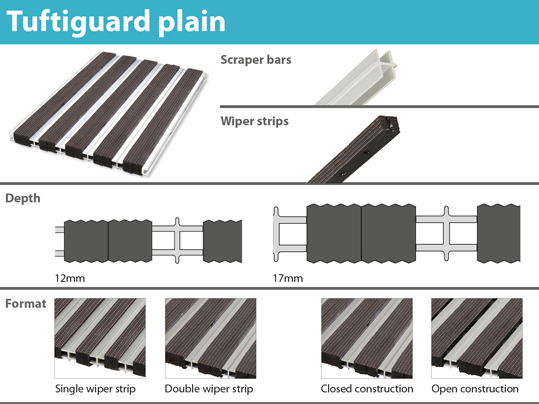 Each Tuftiguard mat is assembled using aluminium (100% recycled), brass or PVC scraper bars, and buffed or unbuffed prime rubber and polyamide fibre composite wiper strips. 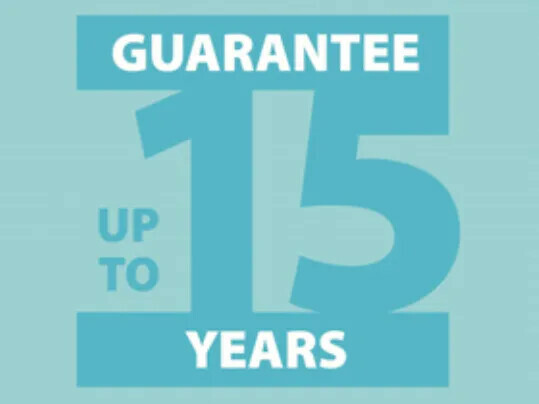 The wiper strips and scraper bars are assembled in an open or closed construction with high tensile electro galvanised steel wire linkages running through the components to give the mat its structural integrity and superior load bearing capacity. 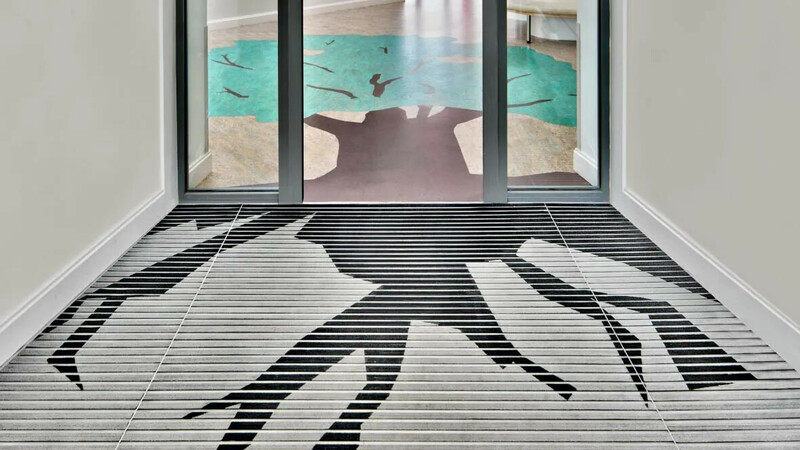 At the heart of the Nuway range, Tuftiguard is our original and best selling entrance mat. It has the durability, strength and structural integrity to deliver excellent performance and appearance retention in intense traffic locations and where high levels of soil have to be removed from the soles of shoes and wheeltreads. 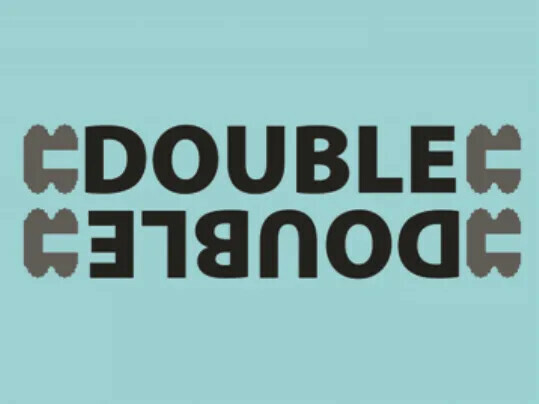 The location, type and level of traffic affects the choice of product. 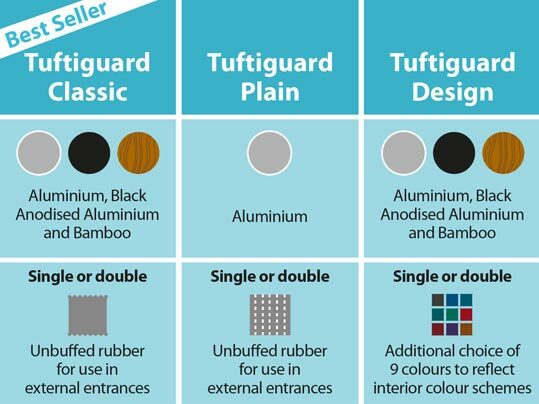 Tuftiguard is suitable for very heavy and intense traffic areas. Matting placed outside will defend against soil and the coarsest of footborne dirt. Inside it will defend against footborne moisture and finer dirt particles. 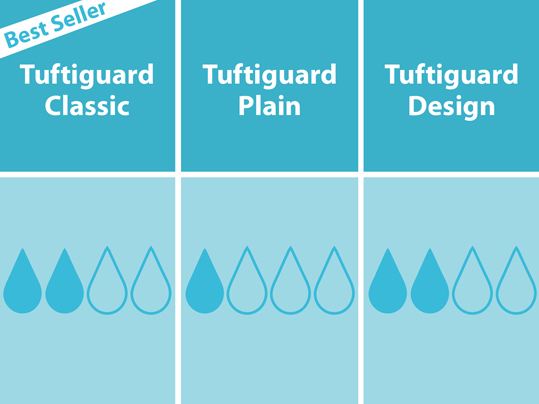 Tuftiguard are double sided mats which can be reversible, effectively doubling their lifespan. 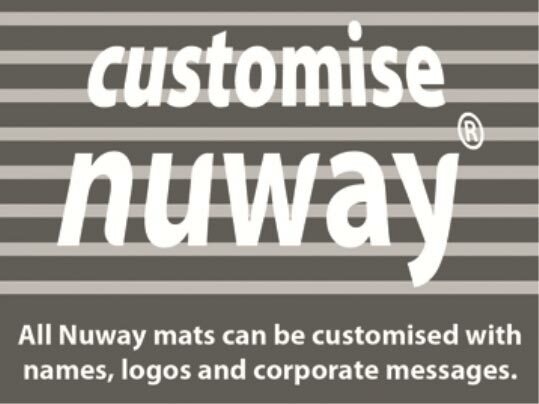 There is a wide choice of wiper strips and scraper bars/carriers and inserts to allow our Nuway mats to co-ordinate with all interior finishes. Removing moisture from the soles of shoes is vital to prevent slipping. 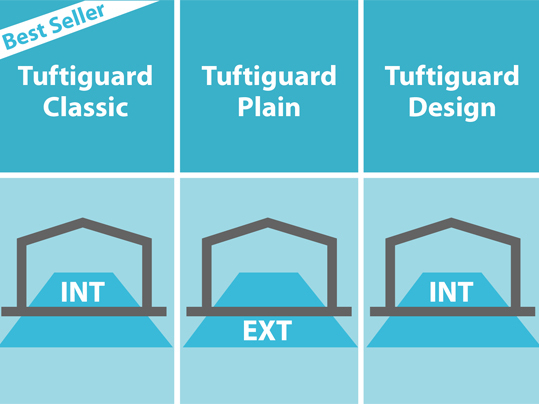 There are three different styles of tuftiguard mat to choose from, each offering a different level of design and performance flexibility. The original and most widely used entrance mat. 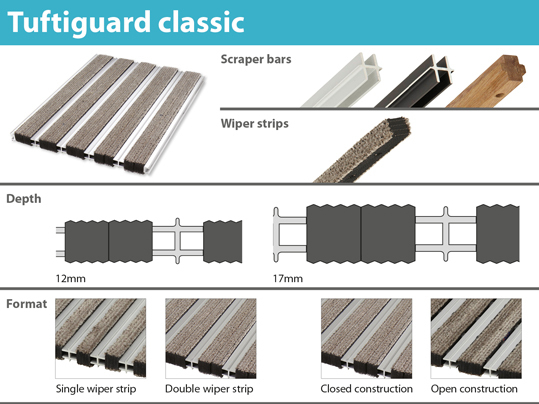 The performance of Tuftiguard Classic but with increased design options through the addition of nine coloured wiper strips. 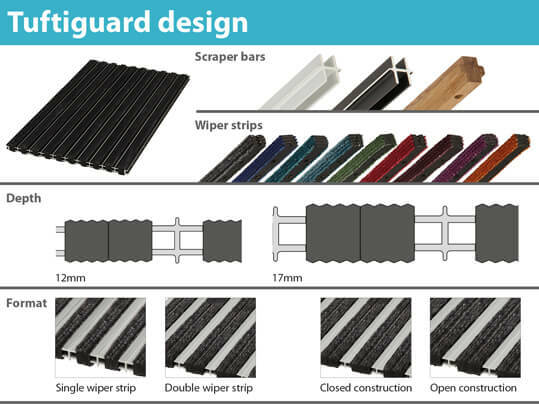 There are nine coloured wiper strips available to allow the entrance to reflect interior colour schemes. There’s a choice of single or double wiper strips for increased moisture removal and stronger colour. 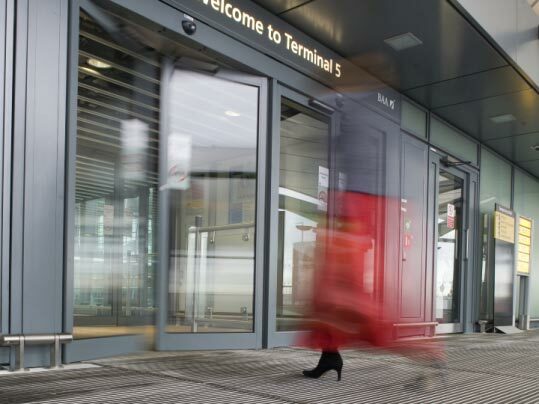 As with all aluminium matting systems of this type, in very brightly lit areas, the strong contrast between light aluminium scraper bar and a dark wiper strip can sometimes create a strobe effect which should be prevented. To avoid disorientating pedestrians affected by this type of visual disturbance, consider using a less contrasting wiper strip.